Comedian Russell Brand is to broadcast a show on Talksport radio, six months after quitting his BBC Radio 2 show following the Andrew Sachs calls row. Brand will present a two-hour football special on Sunday evening with Oasis guitarist Noel Gallagher. The station said the show promises "a heavy dose of cutting-edge comedy" and "the odd eye-opening anecdote". The programme, which will air at 2100 BST, could become a regular fixture if it proves a hit with listeners. Moz Dee, Talksport's programme director, called Brand "a unique talent who understands the medium [radio] brilliantly". "With Noel Gallagher, it'll be a must-listen. Both are proper football fans who just happen to be two of the most creative minds in popular culture," he added. Brand, 33, resigned from his Radio 2 show in October after he and BBC One talk show host Jonathan Ross left a series of explicit messages on the actor Andrew Sachs' answering machine. Two BBC executives resigned in the wake of the affair which prompted a deluge of complaints, while Ross was suspended without pay for 12 weeks. Brand referred to his upcoming return on his Twitter feed, saying the radio show would contribute to "a week of gentle wonder and reckless kissing". 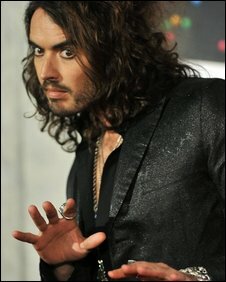 Why is Russell Brand funny?